The many other things I was busy about during my holidays. How much do you know about HIV/AIDS without Googling, really? We did candid interviews with some people and their answers were more often more amusing than informative. We talk about stopping AIDS and stuff but if we don’t know what it really is, how can we fight it? My brother’s company project, Steps is a campaign that aims to push back HIV/AIDS via dance and music. It’s a really cool project, because it involves a huge group of young people. Let me give you a brief description on what Steps is all about. Steps is a campaign that will go on a nationwide tour starting this March. Steps Ambassadors comprising of local celebrities to your ordinary teen next door will be going to schools and learning institutions to look for HIV Champions. HIV Champions are students who have undergone training and are fully educated about HIV/AIDS. And then it gets cooler. The HIV Champions will then learn the Champions Drill from our choreographer Cecilia Yong (Winner of reality TV Show “So You Think You Can Dance?” accompanied by the Steps Anthem (an originally produced piece by Transient Vortex) and just a few days before World Aids Day this year, all the HIV Champions from all over the country will break into the Champions Drill at the same time, same day, from 12 different states through a LIVE broadcast. And they’re moving for a purpose. They’re moving to inspire with their message, “Lead This Change, Stop Aids.” Which brings us to the Steps Official Song by local songstress Juwita Suwito with her own composition, “Leading Change”. We did an official launch recently at Pavilion KL on the 26th of December and that was ONLY the sneak peak. The Steps team will be up and running with various events from now on so stay tuned, spread the word and help us lead this change! Stop AIDS! 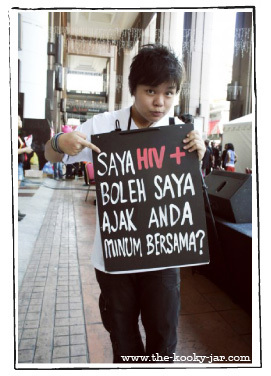 Hmm… I’m an AIDS activist myself… but i must say, it’s very hard to get rid of the stigma in the eyes of the society. Haha, nice to see people educating others about AIDS and HIV. Keep it up!